Ruthiebear (Titusville, NJ, United States) on 21 October 2014 in Lifestyle & Culture. Il surveillait le voisinage ? C'est vraiment étonnant de trouver un lieu comme ça, à l'abandon avec encore plein de choses à l'intérieur... ***** belle journée Ruthie ! Wonderful ST shot. Excellent composition and stunning processing. They do look remote...yes from cheer and happiness!! "Belle " pollution !..................joyeux S T !!! "Beautiful " pollution! .................. Happy ST !!! at the end ... for what to see !!! Looks like my relatives draw - she never throws anything away. Great Silly Tuesday. This chaotic pile of equipment makes a great ST image. Stunning...!!! Superb photo ! Happy ST ! Oh Yes, this is a neat shot. Great job. Sorry sight--used electronics to fill the landfill. 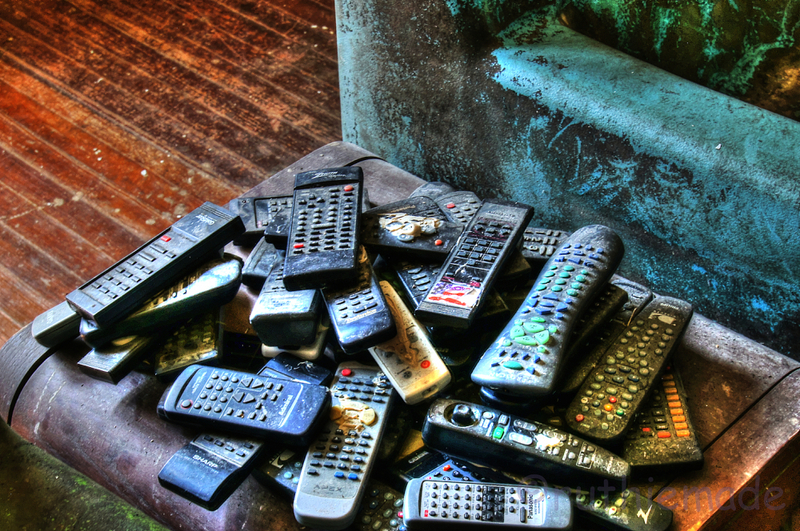 Remembering the array of TVs in one shot, then seeing this one of the remote controllers... very different feel to it. That was elegant in its layout. Seemed organized and special. This seems lonely. Funny, huh? Wow! That is a lot of remotes. Would be easy to get mixed up! Happy ST! Push a button and see what comes on.